Egg tarts, custard tarts, or egg custard tarts are a kind of pastry popular in many parts of the world, particularly in Chinese and Western European cuisines. The tarts consist of an outer pastry crust that is filled with egg custard and baked. Left: Hong Kong-style egg tarts. Chinese egg tarts are an adaption of English tarts with custard filling. Guangdong had long been the region in China with most frequent contact with the West, in particular Britain. As a former British colony, Hong Kong adopted some British cuisine. Another theory suggests that egg tarts evolved from the very similar Portuguese egg tart pastries, known as pastel de nata, traveling to Hong Kong via the Portuguese colony of Macau. 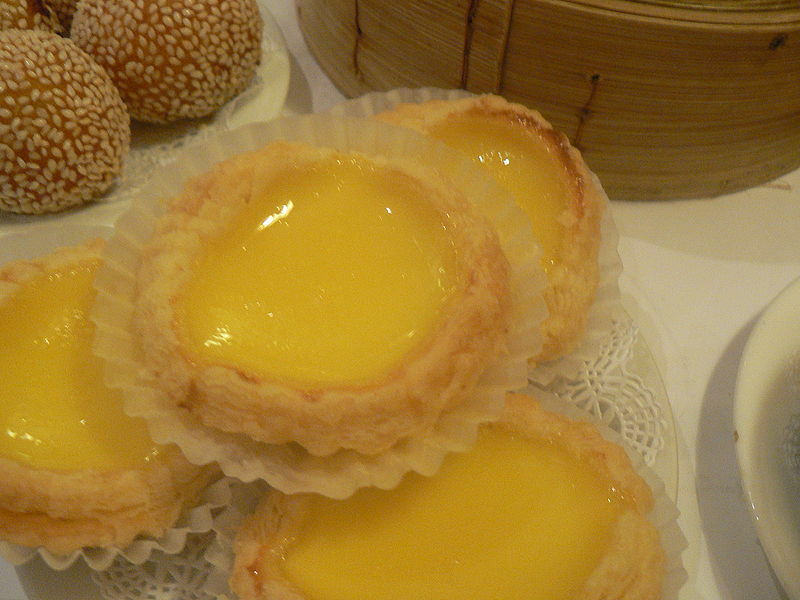 Today, egg tarts come in many variations within Hong Kong cuisine, including egg white tarts, milk tarts, honey-egg tarts, ginger-flavoured egg tarts (the two aforementioned were variations of a traditional milk custard and egg custard, which was usually served in Hong Kong tea restaurants), chocolate tarts, green-tea-flavoured tarts, and even bird's nest tarts. Overall, Hong Kong-style egg tarts have two main types of outer casings: shortcrust pastry and puff pastry, traditionally made with lard rather than butter or shortening. Most Hong Kong Chinese food purists hold the egg tarts made with puff pastry in higher regard. Unlike in English custard tarts, milk is normally not added to the egg custard, and the tart is not sprinkled with ground nutmeg or cinnamon before serving. It is also served piping hot (preferably) rather than at room temperature like English custard tarts.